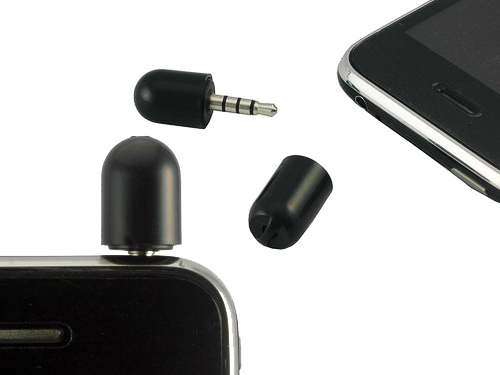 Here’s another accessory for the iPhone, this time it’s for those that like to hear themselves talk. Actually, it’s not just for the iPhone, but for the iPod Touch 2G, iPod Nano 4G and the iPod Classic 120G. It makes it possible for you to record the sound of your own voice in order to make notes of whatever it is you deem important enough. If you thought a bluetooth headset wasn’t making you look self important enough, making audio notes on your iPhone/iPod will finish off the job. Just plug this in and with some of them you’ll be ready to go immediately. However, with the iPhone and iPod Touch you’ll need to download recording software like iTalk Recorder or Easy Recorder. With the Nano and Classic, you’ll be ready to go though. It would be great to record lectures if you’re a student that can never quite seem to keep up with your rambling professors. The microphone is cheap too, you can pick it up for $12.90. That’s far cheaper than a lot of stand alone recording devices I’ve seen.